Hello my friends! 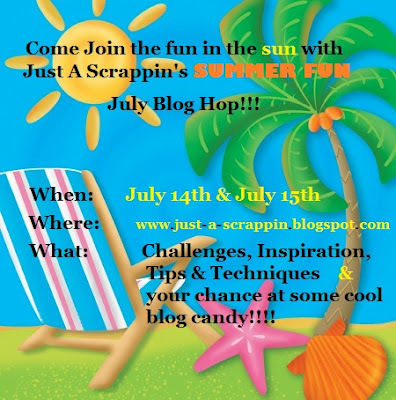 I'm sure by now we can officially say that summer is upon us and to welcome summer we, at Just A Scrappin' are celebrating with our July Summer Fun Blog Hop! Papers used are Bazzill and Echo Park. I cut the ice cream cone from my Doodlecharms cricut cartridge at 3". The ice cream cone can be found on page 106. I added some confetti glitter to the top of the ice cream cone and then coated it with some glossy accents. 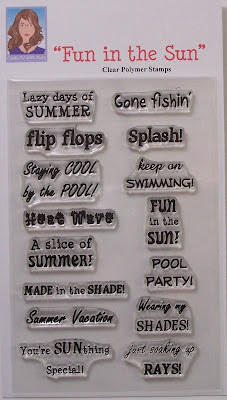 The sentiment I used is from Mary's Fun in the Sun stamp set. I used the sentiment "stayin cool by the pool" from the set and just inked up only "stayin cool". I cut it out using spellbinder's fancy labels 3 die. What better way to cool off in the hot summer sun then by having a cold ice cream cone right? To finish off the card I added some mint green liquid pearls and added some ribbon that I had in my ribbon stash. Here is a list of all the participating DT Sisters. Have fun and good luck on winning some blog candy! Yummy, yummy. I love that you added the bling and glossy accents to your ice cream - it was the first thing I noticed. Great job on your card. OHHH JO... I love this card. This is waaay better than a store bought card! I think that you are so talented! All of your stuff is soo cute. Love that yummy ice cream cone! fantastic card-and I agree with the above ladies that ALL your projects are just great! Just looking at the makes me feel cooler. Nice job. Great card. Love how you did the ice cream cone. Thanks for sharing. Sweet card! Like the use of the stamp. Thanks for letting me visit. I just want to eat this card up! love the colors! Thanks Jo! Jo, I like your style! Nice use of space and colors for this card design. 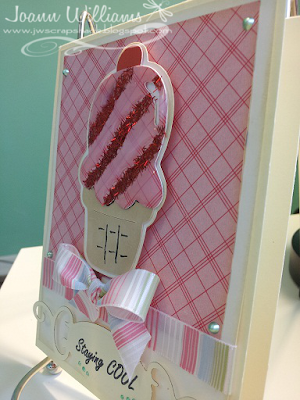 The added embellishments really make the card special. Very feminine summer card, quite pretty! Going to head to the craft room to make this card. love it. Jo this is a great card. I love the perfect bow! Mine never come out that well. New follower here. Your card is beautiful, I love the way you decorated the ice cream cone. Oh you ladies sure know how to make a girl smile!!! Thank you all for the comments and make sure when you leave a comment in the future if you are not a follower, to leave me a way to contact you all so I can leave you some lovin too!! Really cute ice cream cone! Love the glitter! Love the paper and ribbon together! I love your card! Summery and feminine all at the same time! Love the ice cream card, and love that you use the cricut. Got to become a follower. Thanks for sharing. Sooooo pretty!! I love the ribbon, paper, and tag!! This is a wonderful card. I love the ribbon and bling. Nicely done. Oh I LOOOOVE the confetti glitter on the ice cream cone....how adorable and fun! 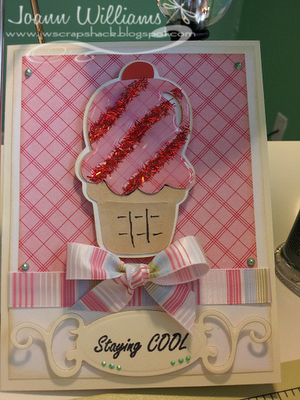 !...perfect for an ice cream-themed card! Great ribbon, too. love the details on the ice cream. such a sweet card, Jo! love it!